Core strength and function - why is it important for a runners? Core strength for runners – Whether you are getting ready for your next parkrun, fun run or marathon, most runners forget to strengthen their core, to their detriment. The importance of your core function far exceeds the look of a six pack, but it is the very foundation of all our movement patterns especially in high demand exercises like running. Most associate core strength to the traditional exercises like sit ups or back extensions but these can actually result in pain or injury due to increased forces on the spine. 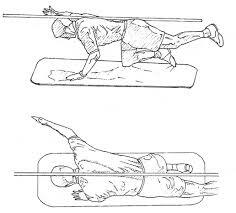 So some of the best core exercises for runners, should incorporate and duplicate the movement patterns of the running gait such as an integrated movement pattern (eg arms swings and leg movements completed at the same time), dynamic (moving rather than holding), core endurance (rather than heavy weights), and contralateral movement (diagonal opposite sides of the body). For this reason, an excellent core exercise for runners is the Horse Stance series. They are generally safe and effective for those beginning a back and core strength program but you should still consult an exercise professional for your individual requirements or any pre-existing conditions. This particular exercise supports the spine in multiple planes of movements, while placing little compressive or gravitational stress on the structure. It also requires the small stabilizer muscles of the spine to resist the spinal torsion created by the diagonal pattern. Place your wrists directly below the shoulders and your knees directly below the respective hip joint. The legs are parallel and the elbows should remain turned back toward the thighs with the fingers directed forward. Activate the transversus abdominis by drawing the belly button inward. Lift one hand off the floor to bring your arm in line with your body. The opposite knee is then elevated off the floor to the same height. Hold for 5 seconds and repeat 8-10 times on each side, or as many times as can be performed with good form. When lifting the hand and knee off the floor, do not let your pelvis deviate toward the side of the support leg. This faulty movement pattern will shift the work out of the core into the hip. So when you are getting ready for your next run, don’t forget your core exercise to get the best times, most efficient gait and least chance of pain and injury. Happy running! Why is core strength and function important for a runner?